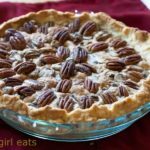 Easy Vodka Pie Crust from Allrecipes.com. Makes 2 pie crusts. Whisk flour and salt together in a mixing bowl. Cut the cold butter and then the shortening into the flour mixture with a knife or pastry blender until mixture resembles coarse crumbs. Sprinkle vodka and water over the top of the mixture. Fold together ingredients until mixture sticks together to form a tacky dough. Divide dough into 2 halves; flatten each half into a disk, wrap in plastic wrap and refrigerate 1 hour or up to 2 days. When you are ready to make your pie, remove dough from refrigerator, roll each piece and bake according to your pie directions.